If you want to experience the natural beauty of a country, heading to protected parks should be a priority. Often, the government prevents the development of these properties, allowing wildlife to thrive and supporting native plant species. In the United States, there are actually multiple major park systems. National parks are designated and operated by the federal government. US state parks are, instead, run by each state. Typically, national parks are better known, particularly outside of the United States. But state parks do have a lot to offer, making them worth exploring. While some are physically smaller than major national parks, like Yellowstone National Park and Yosemite National Park, others are incredibly large. Plus, there are so many more state parks than national parks. While the US has 59 national parks, there are more than 10,000 state parks, and each one has something unique to offer. Some of the best state parks in America have modern amenities, campsites, rentable cabins, boat launches, horse stables, swimming pools, and even golf courses. Additionally, many are conveniently located near urban areas, so you don’t have to go too far off the beaten path to spend some time in the wilderness. The United States isn’t just divided into fifty states. There are four main regions, each of which is separated into multiple divisions. While American state parks are operated by states, examining your options in each region and division can help you explore all of what the US landscape has to offer. The United States is a geographically diverse nation, so each state does have something unique that is worth exploring. But, if you can’t make a stop in each one, the region and division approach can provide you with a solid representation. Whether you are looking for the best state parks for camping, hiking, boating, or picnicking, here are the ones that should end up on every traveller’s list. The Northeast region of the United States has a lot to offer. During autumn, the leaves shift from vibrant greens to dramatic reds, fiery oranges, and radiant yellows, making a stroll down a trail in the crisp air particularly magnificent. Many Northeast region states also have stunning shorelines, either bordering a major lake or the Atlantic Ocean. New England consists of Connecticut, Maine, Massachusetts, New Hampshire, Rhode Island, and Vermont. 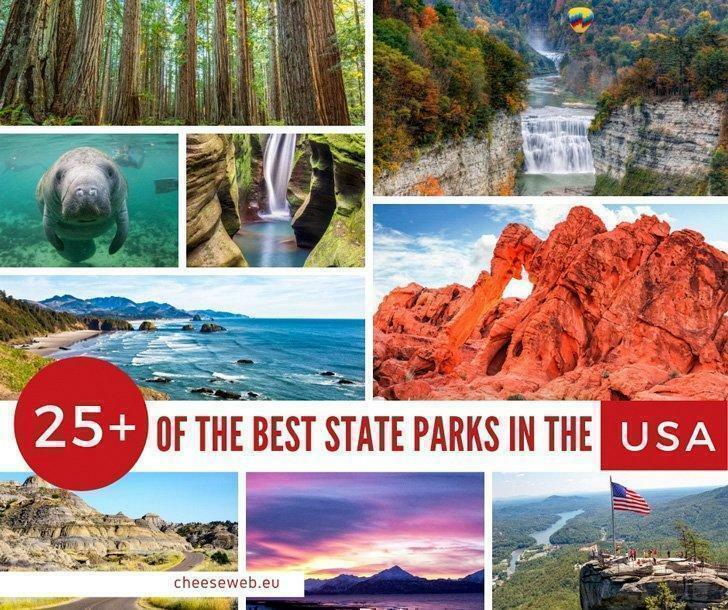 While each one of those states has some amazing parks, here are a few you shouldn’t miss if you only have a limited amount of time to explore. Considered one of the best state parks on the East Coast, Quechee State Park is an essential destination in New England. You can view the deepest gorge in the entire state here, or hit the Quechee Gorge Trail to take in the 165-foot crevasse that was carved over 13,000 years ago by glacial melt. Plus, the colors in autumn are genuinely spectacular. 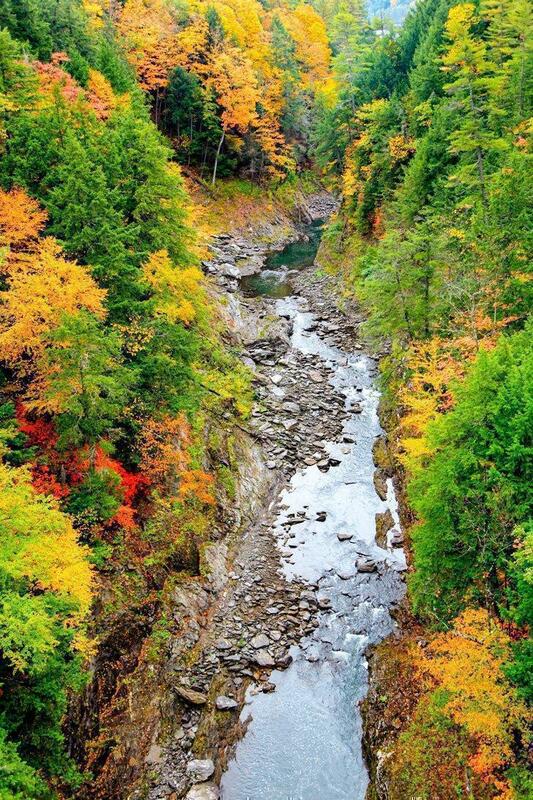 If you want to see the foliage change color with a vibrancy you may have never experienced before, Quechee State Park is the ideal place to go. In comparison to some other state parks, Umbagog Lake State Park is a bit remote. However, if you want to view quintessential North American wildlife – like bald eagles, foxes, and moose – you have that chance here. Consider heading out onto the lake with a pair of binoculars by your side. As you cruise across the water, you may be surprised by what you could spot. The Mid-Atlantic area only consists of three states: New Jersey, New York, and Pennsylvania. However, each of these states has a large park system, so there is plenty to explore in this division. If you want to see some of the best state parks in the Mid-Atlantic, consider making these a priority. 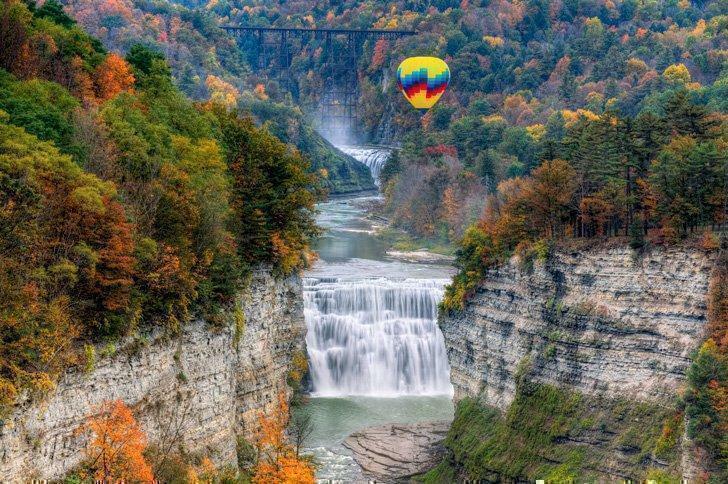 Part of the New York State Parks system, Letchworth is one of the best state parks in NY. Dubbed the “Grand Canyon of the East,” Letchworth State Park, NY, offers breathtaking canyon vista views and huge waterfalls. It is truly picturesque. Letchworth State Park camping options are also available. Along with tent camping, you can also rent Letchworth State Park cabins if you prefer something more robust. Plus, you’ll have access to a bathroom and showers, which is something nearly everyone can appreciate. If you want to check out the Letchworth State Park map before your visit, giving you a chance to plan hiking routes or find the best camping spots, you can head over to the park’s website. This is especially beneficial if you want to snowmobile in the area, as that is only allowed in specific areas, or do some bird watching in the bird conservation section. 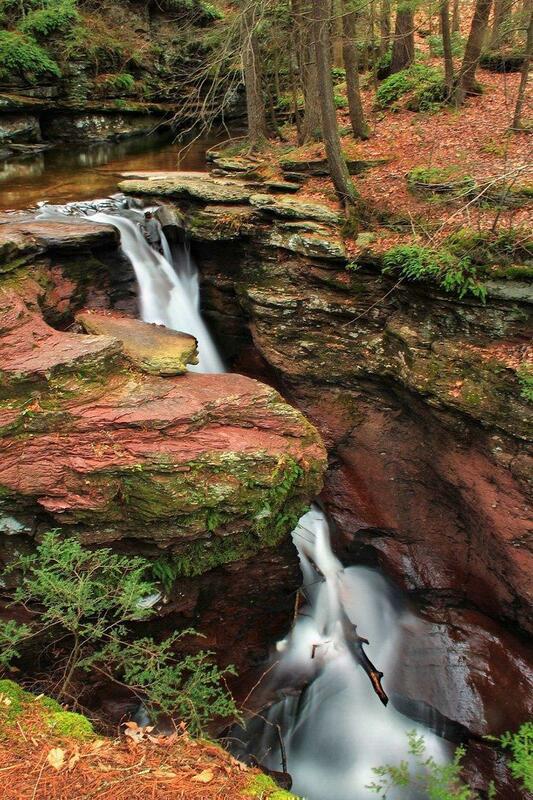 Home to 24 named waterfalls, with heights ranging from three to 94 feet, Ricketts Glen State Park is a truly picturesque destination. You can view nearly all of the waterfalls by walking the 7.1-mile loop known as Fall Trail. If you head out in autumn, you can also experience the magnificence of the foliage changing colours. While it is always beautiful, this time of year makes it genuinely something special. If you want to check out the largest state park in the US that is home to one of the top-rated day hikes in the country, Hudson Highlands State Park is a great choice. You can travel through marshlands along widening trails and continue up until you reach the exposed rock faces. Plus, it clearly becomes one of the best NY state parks for city-lovers as well thanks to the ability to gaze upon New York City from the summit of the Mount Beacon fire tower on clear days. However, if your idea of the best state parks in New York state includes nature views, you won’t be disappointed either. Just head out to the Overlook Trail to Lamb’s Hill, and you can set your eyes on the mountains and surrounding valleys. The Midwest region of the US offers visitors a chance to view rolling plains or walk through beautiful mountainous terrain. Picturesque lakes and roaring rivers are common in this area of the country, making it a great destination for boaters as well. Illinois, Indiana, Michigan, Ohio, and Wisconsin make up the East North Central division in the United States. Each one of these states touches a Great Lake, though the amount of coastline varies dramatically from one to the next. Plus, they have some stunning landscapes to explore as well. Here are some of the best state parks in the Midwest. 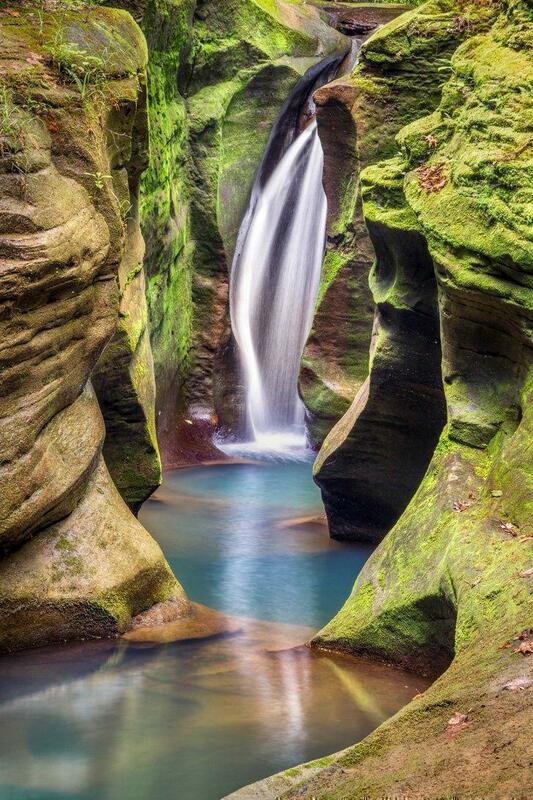 If you want to stop at one of the best state parks in Ohio, Hocking Hills State Park feels a little like a hidden gem. Along with stunning canyons and waterfalls, there are also some incredibly challenging hiking trails. Plus, it isn’t as popular as some other destinations, so you won’t be fighting with large crowds while you try to take in the amazing views. While most people wouldn’t expect to find amazing natural views and massive gorges in Indiana, that is exactly what Turkey Run State Park has to offer. There are several sandstone gorges, all of which stand out from the surrounding landscape. Plus, the historic Cox Ford Covered Bridge is a fantastic photo opportunity. If you want to share images of your journey, that is one you simply must take. 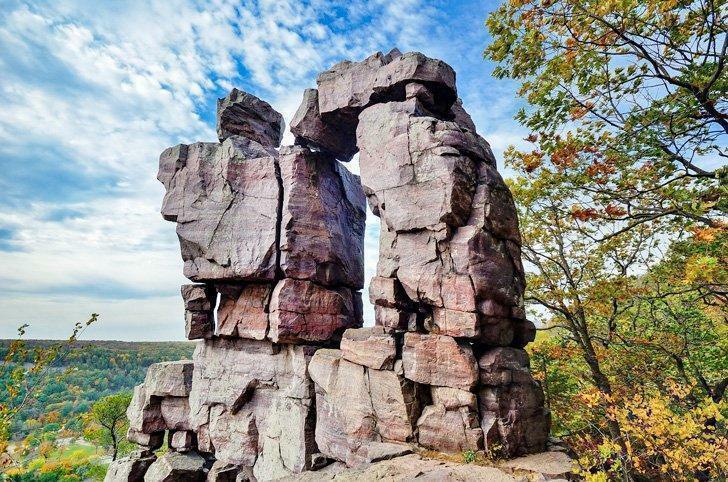 From gigantic quartzite cliffs to glacial moraines, Devil’s Lake State Park has a lot to offer visitors. Plus, Native American mounds are scattered throughout the park, giving the area a deep and rich history. Devil’s Lake State Park is also a favourite destination for camping and fishing. It is actually the most visited state park in all of Wisconsin, but it never feels overly crowded despite how many people are fans. When people picture the Midwest in their minds, states in this division are usually what they imagine. Consisting of Iowa, Kansas, Minnesota, Missouri, Nebraska, North Dakota, and South Dakota, this area has its fair share of rolling plains and mountainous regions, making it a classic destination for travellers. If you head to the West North Central division, here are some must-see stops. If you enjoy strolling through castle ruins, Ha Ha Tonka State Park in Missouri needs to be on your travel bucket list. The structure was originally built in 1905, and a decent portion of it remains today. In the US, that makes this park pretty unique. Plus, the park has a lot more to offer. You can explore caves, lakes, and more in the 3,700-acre park, giving you plenty of options. Considering all of that, it’s easy to see why Ha Ha Tonka State Park is one of the best state parks in Missouri. If you love fishing, nothing beats Itasca State Park in Minnesota. There are 100 lakes inside the 32,000-acre park, so there are plenty of opportunities to explore the bounties provided by the local waters. Just make sure to grab a fishing license if you decide to fish. Otherwise, you may want to simply enjoy the water views and hiking options. 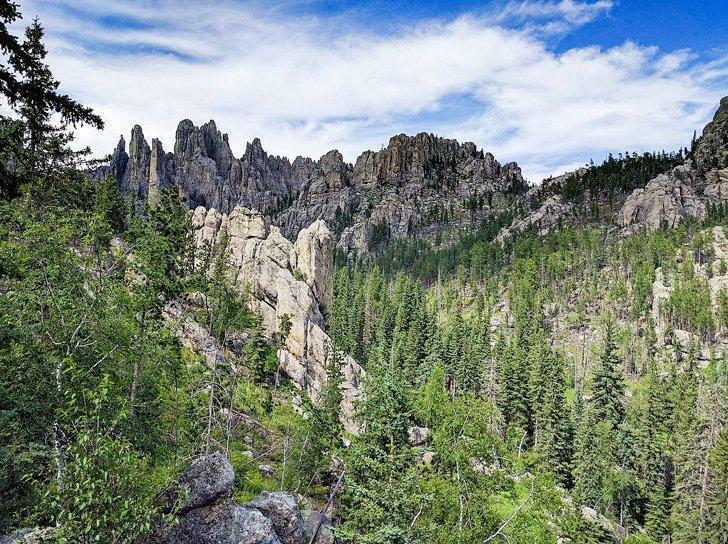 Located in the breathtaking Black Hills, Custer State Park is filled to the brim with wandering bison and amazing vistas. 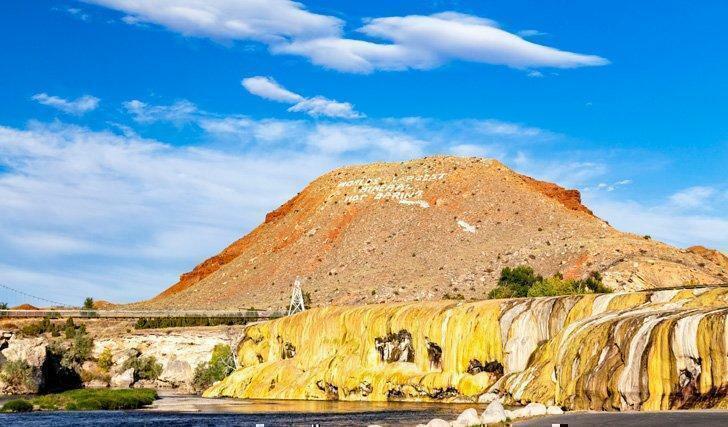 It is also close to other popular destinations, including Mount Rushmore, Crazy Horse Memorial, and Wind Cave National Park, so you could plan an entire vacation around being in the area. Plus, it has a remote feel without being too far from civilization, which is especially convenient for travellers. The South Region of the United States is incredibly diverse geographically. You can find anything from swamps to deserts to mountains, depending on where you head. Home to the nation’s capital, the South Atlantic division includes Delaware, Florida, Georgia, Maryland, North Carolina, South Carolina, Virginia, West Virginia, and, of course, the District of Columbia (Washington DC). Whether you want to explore the natural swamp lands in the south, take a tour of the East Coast, or stroll through magnificent mountains, here are some state parks you should consider first. One of the best state parks in Florida (or even one of the best state parks in the southeast), Torreya State Park is a hiking favourite. While the majority of the state of Florida is fairly flat, you can find steep bluffs and deep ravines here, giving you altitude changes and exciting paths to follow. Plus, there are tons of interesting native plants and more woodpeckers than you can shake a stick at. 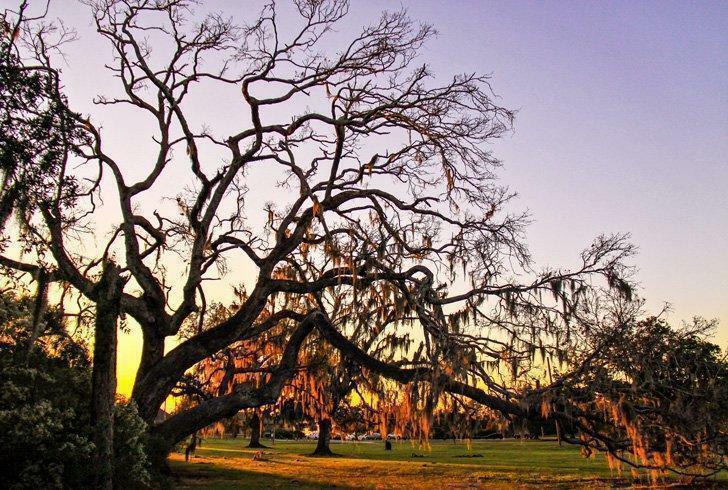 It isn’t what people traditionally think of when they picture Florida, and that is why Torreya State Park should be on your list. If you want to experience something that is a more traditional version of what Florida has to offer, Manatee Springs State Park should be your go-to destination. 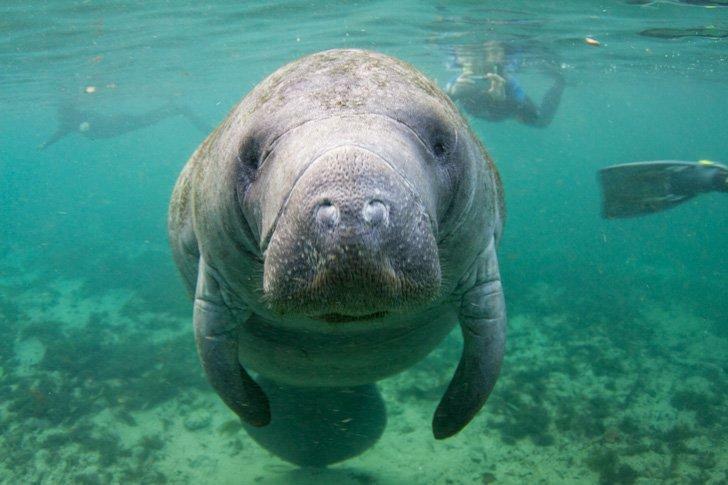 Manatees come to the area to soak in the warmth of the park’s basin, which is usually around 72 degrees. Plus, there is tons of other wildlife that call the area home, and it’s great for scuba diving, boating, hiking, and camping. Mountain bikers flock to Pocahontas State Park, Virginia, to enjoy that more than 25 miles of amazing trails. Plus, it is the largest state park in Virginia, featuring fun amenities like swimming pools and numerous campgrounds. But, if you are looking for the best Virginia state parks, Pocahontas State Park should be your go-to destination. 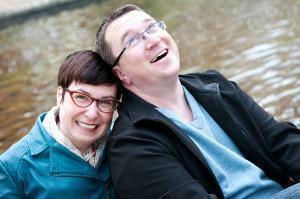 It is just a short drive from Richmond, Virginia, so the location is convenient too. 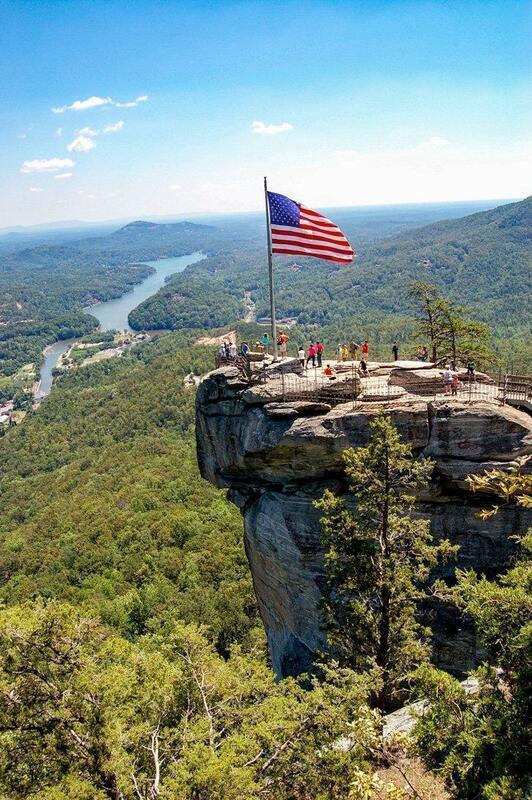 Chimney Rock State Park is one of the best state parks in North Carolina, hands down. The over 6,800-acre park is home to spectacular views and tons of trails. Plus, you can rock climbing in certain sections of the park, or head over the to massive granite monolith balanced rock and an over 400-foot waterfall. If you are a movie buff, then Chimney Rock State Park is a must-see. Portions of The Last of the Mohicans were filmed at the park, including the final fight scene along some of the cliff edges. When it comes to the best state parks on the East Coast, having a Hollywood connection is another reason this one rises to the top. The East South Central division is made up of four states: Alabama, Kentucky, Mississippi, and Tennessee. While these states aren’t well known for beaches, two of the states do have coastline on the Gulf of Mexico. 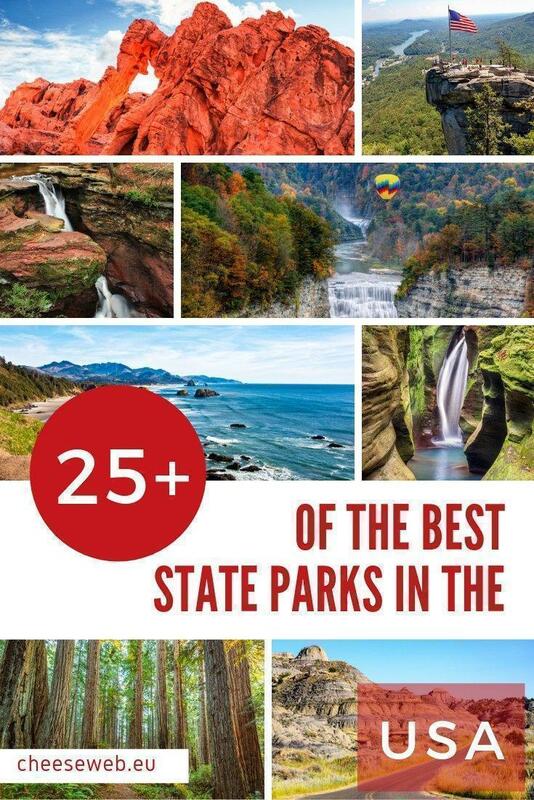 Plus, you can find anything from swamplands to rolling plains to magnificent peaks here, so there is a surprising amount to see if you head to the state parks listed below. If you want to visit a state park with a ton of historical significance, Tannehill Ironworks Historical State Park is a great option. 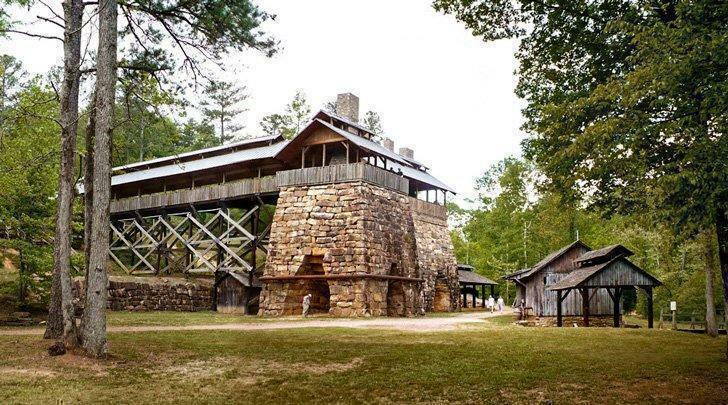 Not only is it an important stop along the Civil War Discovery Trail, but it also features the best-preserved stone blast furnace in the south. Plus, this state park is home to the Alabama Iron and Steel Museum, giving you a chance to learn about the region. You can also explore the several miles of hiking trails, including paths that were travelled by ore miners and ironworkers so many years ago. If you want to see the highest waterfall vertical drop on the East Coast, then you need to take a trip to Fall Creek Falls State Park in Tennessee. Fall Creek Falls is truly magnificent to behold, but it isn’t all the park has to offer. Along with five other waterfalls, there are tons of camping opportunities and miles of hiking trails. In total, there are 26,000 acres to explore, so it is definitely worth the trip. Arkansas, Louisiana, Oklahoma, and Texas make up the West South Central division. Here, you can explore the coast of the Gulf of Mexico, see alligators in swamp areas, head out into the desert, and even find forested regions. If you want a taste of everything this region has to offer, including some unique experiences, here are the state parks you need to see. If you want to have a genuine bayou experience, make sure to check out Fontainebleau State Park in Louisiana. Just an hour outside of New Orleans, you can explore the 2,800 acres located along the shore of Lake Pontchartrain. There are miles and miles of hiking and biking trails too. Plus, visitors often spot alligators at Alligator Marsh, which is what visiting the region is all about. Along with being a somewhat unique experience, Fontainebleau State Park is certainly one of the best state parks in Louisiana thanks to its family-friendly camping options, making it easy to enjoy the area for more than one day. 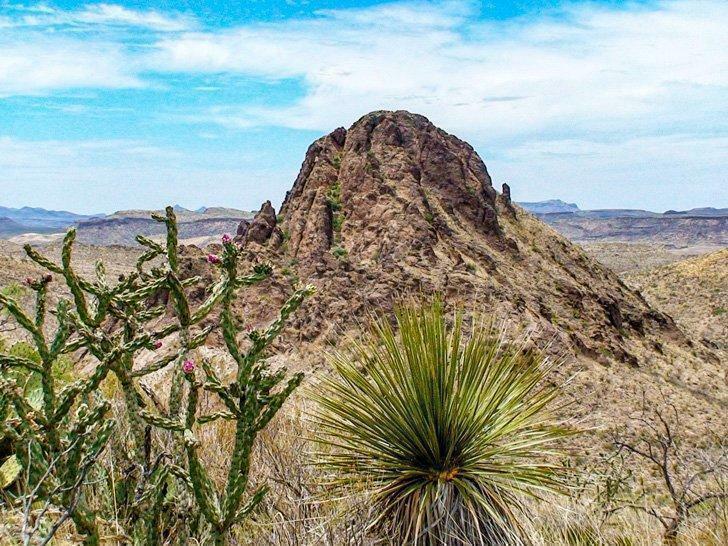 When it comes to United States state parks, nothing feels more like the Texas you see in old westerns than Big Bend Ranch State Park. It stretches across about 311,000 acres and features a mindboggling 238 miles of trails, giving you a chance to explore a remote desert landscape. Even if the weather is warm, make sure to wear very sturdy shoes while hiking. Along with the trails being quite lengthy, there is also a decent amount of cacti around, so sandals aren’t the safest footwear choice. If you want a unique experience, head over to Crater of Diamonds State Park in Arkansas. While you are there, you are allowed to hunt for diamonds. Plus, if you find any, you get to keep them. The park has diamonds because the main field is actually the surface of a volcanic crater, making it home to a range of gemstones, rocks, and minerals. You can bring your own mining tools (as long as they are not motor-driven or battery-operated) or you can rent them from the park. If you find something, park employees will even help you identify it. While you are there, you can also stroll the trails, enjoy a meal at a picnic site, stay at well-appointed campsites (including access to power, water, and sewer service), or spend some time at Diamond Springs Water Park, as long as it is during the warmer months. The West Region is likely best known for its topography. Mountains are common in the area, and every state that touches the Pacific Ocean is in this group. 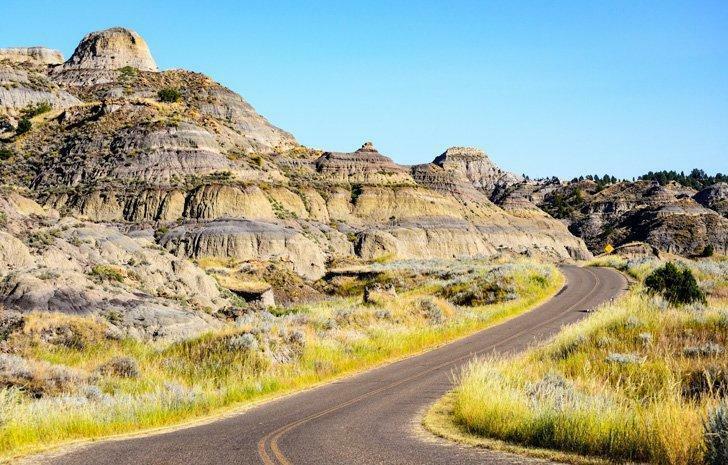 This means you can experience a ton of diverse landscapes if you focus in this region alone, which may be an ideal approach if you are travelling to multiple parks but don’t have time to work your way across the entire country. As the name of the division suggests, there are tons of mountainous areas in the states that make up the Mountain division. Arizona, Colorado, Idaho, Montana, Nevada, New Mexico, Utah, and Wyoming all have amazing topography. Plus, there are deserts, plains, and rivers open to visitors that are worth exploring too. Here are some of the best state parks in the Mountain division. 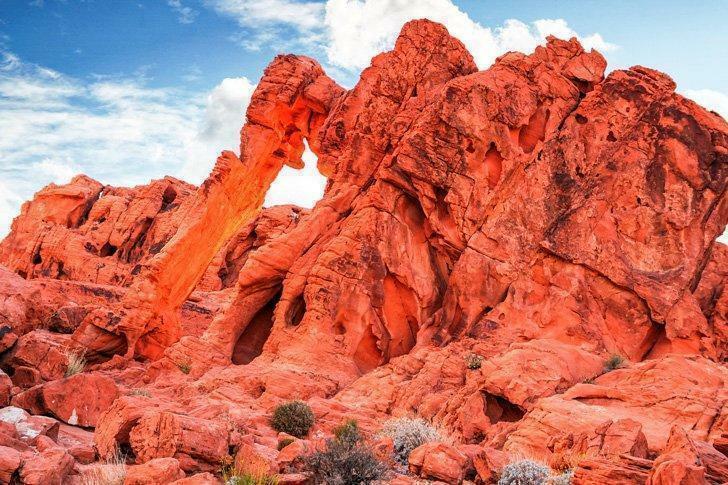 A park that many consider a hidden gem, Valley of Fire State Park in Nevada features some of the most spectacular desert red rock formations you could ever hope to see. Natural arches are also common in the park, as well as petroglyphs and petrified wood. It’s all located just a bit to the northeast of Las Vegas, so it is conveniently located too. Just make sure you don’t underestimate the heat, particularly near and during the summer. This is one park where you want to bring drinking water with you, even if you only plan to stay for a little while. While exploring the park, you can also find petroglyphs. If you are lucky, you might even spot the small herd of bison that call the area home. If you love dinosaurs, then plan on heading over the Makoshika State Park. Tons of fossils have been found across the park’s 11,000 acres, which makes it a fun destination to explore. Plus, there are cool rock formations, nature trails, and even a small campground. The park is also open to hunting, as long as you have the proper license. Every state in the Pacific Division touches the Pacific Ocean. While this is a boon for beachgoers, you can also find other unique features, including active volcanoes. If you head out to the Pacific division, here are a few state parks you need to add to your travel itinerary. At some point, every traveller should spend some time wandering through the California Redwoods. Not everyone has a chance to see trees stretching 300-feet into the air, let alone camp under them. Prairie Creek Redwoods State Park features a main road that you can drive through and take in the massive trees as well. 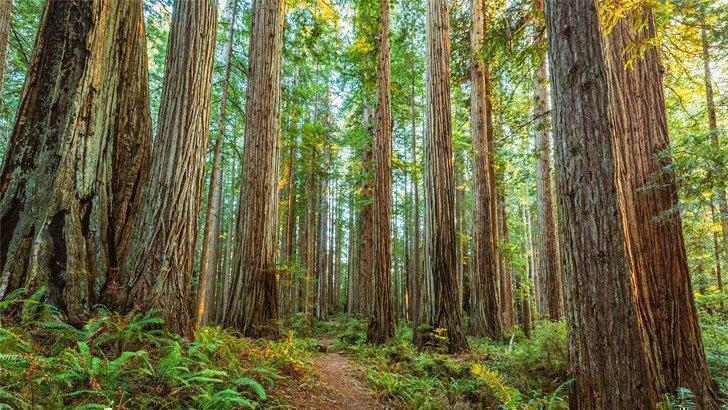 Plus, it is easy to pull over and stroll down one of the numerous hiking and biking trails, giving you a chance to truly experience how gigantic these redwoods are by standing among them. 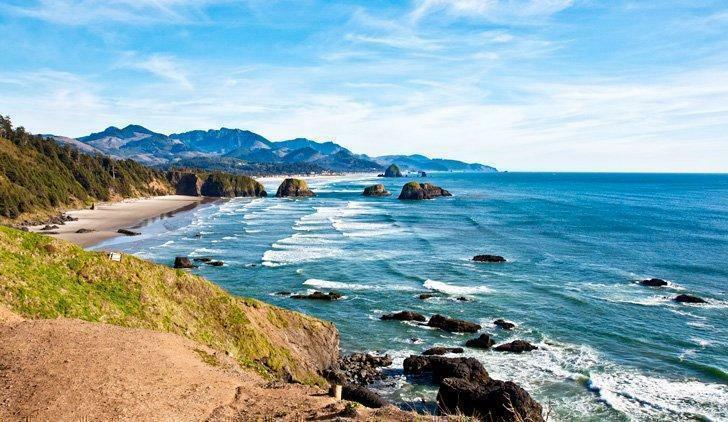 For seaside views and stunning rock formations, Ecola State Park is a great option. You can listen to the Pacific Ocean waves crash into the rocks and shore, breathing in the fresh air while enjoying the breeze. If parts of the park look familiar, it could be because you have actually seen it before. The park is shown in many movies, most notably the cult classic film from many people’s childhoods, The Goonies. In some cases, heading to the right state park gives you a chance to truly get away from it all. 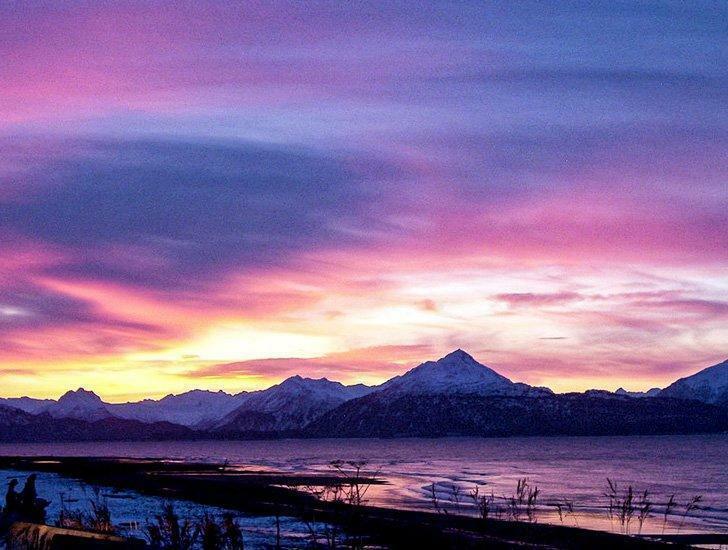 Kachemak Bay State Park in Alaska is incredibly remote, making it possible to completely disconnect and spend some time focused on the magnificent wilderness. Bear, wolves, and moose are commonly spotted in Kachemak Bay State Park. Plus, you may have a chance to spot seals and whales, too, making it a somewhat unique destination for animal watching. If you want to leave civilization behind for a while, Kachemak Bay easily qualifies as one of the top state parks for stepping away from the modern world. The only way to reach the park is by plane or boat, so you definitely have to plan ahead to head here. But, it’s worth exploring it as an option, especially if you want to visit some unspoiled terrain.